Mallet 75 WSP, in addition to protecting the health of turf and landscape ornamentals from within the plant, provides fast knock-down, broad-spectrum control, long lasting grub and insect control with preventative and curative properties. Mallet 75 WSP Turf Insecticide contains imidacloprid for consistent performance and flexible application timing. 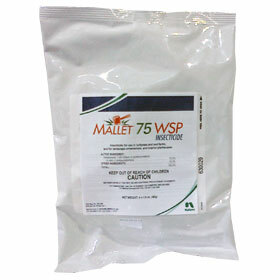 Mallet 75 WSP provides fast knock-down and broad-spectrum insect control with preventive and curative properties. With its consistent performance and flexible application timing, Mallet 75 WSP is a valuable addition to your arsenal of pest control. Would you like to see the Mallet 75 WSP Label? How about the Mallet 75 WSP MSDS sheet?